Accredited Lean Six Sigma Training Organization with both online and classroom based training courses in Lean Six Sigma methodology, tools & techniques to businesses and individuals in the North of England, Switzerland and the United States. Our training follows the ISO-13053 and ISO-18404 guidelines for Lean Six Sigma. Member of the North East England Chamber of Commerce. We administer our certification exams through the International Association of Six Sigma Certification (IASSC). Yellow, Green and Black Belt. We administer our online training and exams through our partnership with 6SigmaStudy.com who are one of the world’s largest providers of Lean Six Sigma training and exams. Located in the North of England with monthly training in Manchester, Newcastle and Leeds. Modern and comfortable training facility with WiFi. Also providing training in RPA, Control Room Management, Workforce Augmentation, Blue Prism Training, Automation Academy, Automation Anywhere Training, UiPath Training, Virtual Workforce, Process Automation, Automation, and Robotic Process Automation ( ask for more details ). 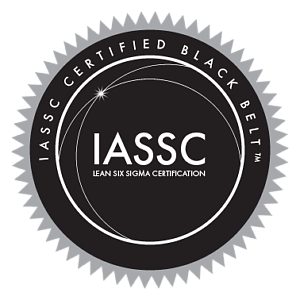 The world’s Leading brands, Universities and Government agencies trust IASSC as a source for Lean Six Sigma Professional Credentialing in their pursuit of excellence.IASSC has a long track record of creating value for our customers through our breadth of expertise in Lean Six Sigma Professional Credentialing. We demonstrate this expertise and commitment through our world recognized LSS standards in our Accreditation and Certifications programs. Here are some of the well known brands that rely on IASSC for their Lean Six Sigma Professional Credentialing.